All Geeks Rejoice: Wicked Anime Reviews #8: Durarara!! A highschooler decides to move into a big city thanks to the encouragement of his friend. He quickly learns that things aren't quite what he expected. Rival gangs, a twisted information merchant, an urban legend of a headless rider, weird experiments, a demonic serial killer, and a love triangle are just some of the things he gets involved with shortly after moving. No big deal right? 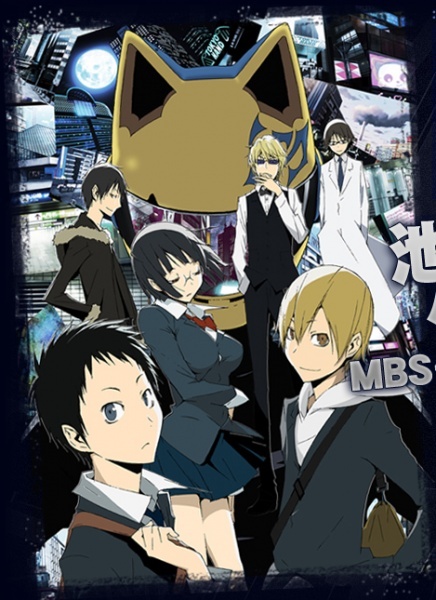 The single thing that Durarara does perhaps better than any other Anime is break apart the perspective of the story to show how it's composed of the sum of its parts. The actual events don't get fully exposed to the viewer because we're seeing each event unfold from the perspective of multiple groups or individual characters. As you continue to watch, the layers get added onto one another and you can finally see the full picture of what's going on. Another thing Durarara does well is making a massive cast of lovable and quirky characters that are all capable of bringing laughter in one way or another. The advantages of having a large cast means you'll be sure to adore at least a few of the characters. Having a large cast for such a short series is both a blessing and a curse. Due to the sheer number of characters, and the fact that most details are shrouded in mystery at first, things start off a bit slow. You'll be wondering for the first few episodes whether the series is really going anywhere and you definitely won't get fully involved with some of the more interesting characters right off the bat. A great example is Celty. It's very obvious in retrospect that she's a main character but you won't get heavily introduced to her until several episodes in. Mid-way through though you'll feel like she was a close friend all along. This is Kylak signing out and warning you about flying vending machines.